has a third dimension representing wavelengths or frequencies. has a minimum info in the header. The header should have units but the algorithm works in velocity space (dlamba/lamba or dfrequency/frequency). Check the Instrument.z_step_kms value which is critial for the kinematic parameters. If the header is incomplete (CRPIX3, CDELT3, CRVAL3, CUNIT3), the algorithm will try to use the default values assigned to the instrument. The user can specify these directly. best to provide the variance in a separate file or via a MPDAF Obj.Cube. If no variance is specified, the cube statistics will be used. You should specify the PSF and spectral LSF that are in effect for your cube. Don’t trust the defaults. For MPDAF users, a MPDAF Obj.Cube object is ok as input. seeing=1.0 is equivalent to galpak.MUSE(psf_fwhm=1.0) The proper way to specify the seeing is specified in customizing-the-psf. The input can also be a Hyperspectral Cube. Actually, GalPaK will instantiate one from your fits file if you pass a string filename. You can find other test FITS cubes in data/input/. In future version, the variance can be specified as a “STAT” or “VARIANCE” extension to the fits file. Make sure to look at the MCMC chain. Have all the parameters converged? Check that it has the central wavelength z_central taken from the fits header, which determines the right velocity ‘step’ (cdelt3 in km/s). If the header is not correct, you have several options to set the central wavelength with z_central or cdelt3 or cunit3. Check that the LSF and PSF parameters are ok - see below for how to tweak them. and check again that the 3D kernel gk.psf3d is correct ! A wrong kernel will lead to unphysical results. 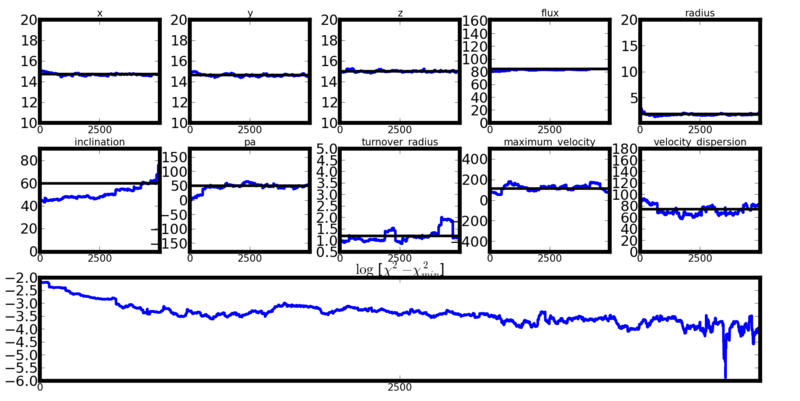 Both run and run_mcmc use a DiskModel object with exponential flux profile per default, arctangent rotation profile and thick disk dispersion. The flux profile of the galaxy. 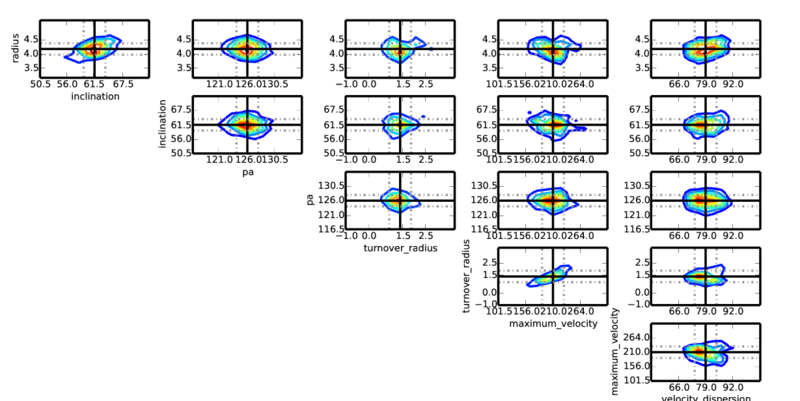 The run_mcmc method returns a GalaxyParameters object. to see the parameters (gk.error contains the error vector). Use the methods of GalaxyParameters tofile or tolist to store this. It will create a bunch of files prefixed by my_run in the current working directory. See the save() method documentation for the list of files that will be created. Method used to determine the best parameters from the chain. The boundaries you provide will be merged into the default boundaries. You can (and should) tweak the random_scale parameter of the run_mcmc method in order to get an acceptance rate around 30-40 %. The value you provide is the a coefficient (default=1) applied to the random walk of the parameters. 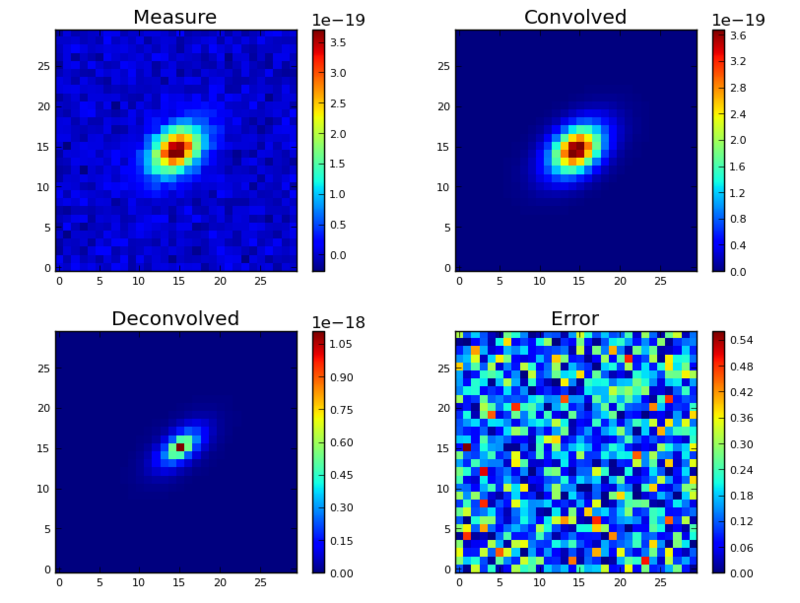 Conversely, a less-than-one random_scale, in combination with initial_parameters, can be used to fine-tune your results by reducing the steps of the random walk. 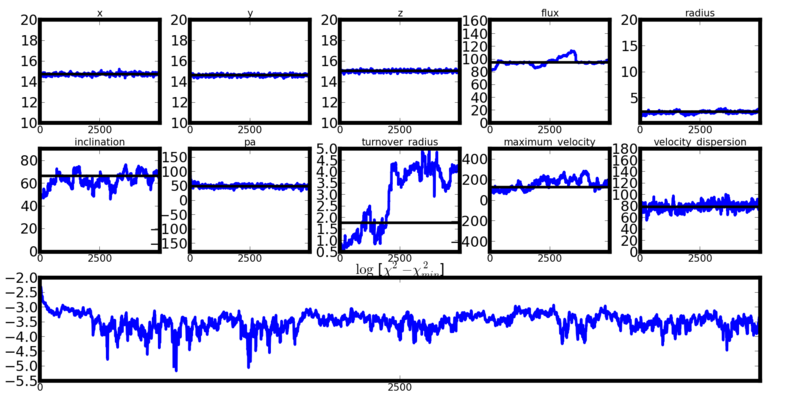 You can specify the instrument that will convolve the simulated data. By default, the instrument will combine the psf (2D) and the lsf (1D) into a 3D spread function and will apply it to the cube in the method convolve(cube). More details about the instruments. Only the rest-wavelengths are needed regardless of redshift because the algorithm works in velocity space. 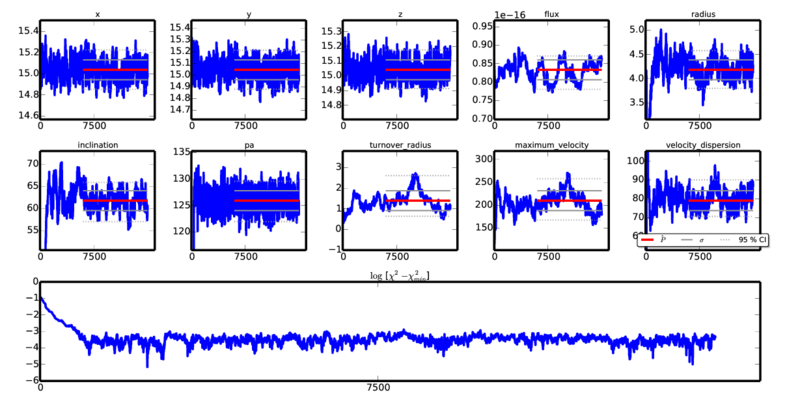 Here, you specify the velocity difference for the two lines in the doublet, 3e5*(l2-l1)/(l1+l2)*2, so the redshift does not matter. For version >= 1.9.0, this line parameter is now part of the DiskModel class. For version = 1.9.0, this line parameter can also be used as in prior versions. The galpak module provides GaussianPointSpreadFunction and MoffatPointSpreadFunction. They each have a number of parameters you may provide upon instantiation. #   fwhm         = 0.8 "
where shape is the image shape (which should be the same shape as the cube.shape[1:] spatial dimensions). You can create your own PSF, it just needs to implement PointSpreadFunction. A spread function that does not spread anything, and will leave the cube unchanged. Passing this class to the instrument's psf is the same as passing None. Return the identity PSF, chock-full of zeros. The galpak module provides GaussianLineSpreadFunction and MUSELineSpreadFunction. They each have a number of parameters you may provide upon instantiation. You can create your own LSF, it just needs to implement LineSpreadFunction. Convolve the provided data cube. Should transform the input cube and return it, it is faster than copying. If you do create your own instrument, please consider making a pull request ! The file you want to edit is lib/galaxy_parameters.py. Update the list GalaxyParameters.names, add ‘sugar’ at the end. doc (string) : some documentation that will appear to the enduser. precision (string) : the precision to use during string casting, as used by string.format(). This is experimental and has not been validated. Please use with caution and send feedback.